Police have arrested 13 people involved in a south China nightclub where a fire on Saturday killed 43 people. State media said five officials in Shenzhen, near Guangzhou, will be punished, including district, fire and police staff. Local reports say the Wuwang (Dance King) nightclub was unlicensed, and ignored by local authorities. The fire began when a stage fireworks gun misfired and crowds stampeded into one badly-lit exit. Five of the 43 killed in the fire were from neighbouring Hong Kong, including an 18-year old boy there to celebrate his birthday with four friends. Only one of those friends survived, and is among 88 others injured in the fire. Shenzhen authorities told local media that the nightclub had been "illegally operating without proper licenses" for about a year. The club's general manager, vice-general manager, safety officer, technician and performers were detained. 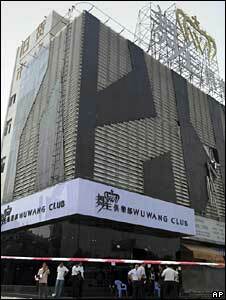 The club's legal representative, Wang Jing, had fled after the accident but has since surrendered, police said. Some district officials are also expected to lose their jobs. "There was something wrong with the architectural design," Guangdong Province Governor Huang Huahua told Hong Kong media after inspecting the nightclub. "If there was a better ventilation system, there wouldn't be so many deaths in the fire," he said. The nightclub had a capacity of about 380 people, but witnesses said it often had three times that many people inside. They said windows were boarded up and exits blocked, with the one adequate exit route un-signposted. Witnesses told the Hong Kong newspaper, the South China Morning Post, that many of those who died could have survived with a better escape route. Taxi drivers waiting outside told the newspaper the club was popular for the cheap drinks and because "people were free to do everything there". "It's an open secret that many young people were abusing drugs in the club. They often could not stand up by the time they came to get in my cab," one driver was quoted as saying. Reporters said that many Hong Kong people go to nightclubs across the border in Shenzhen or Guangzhou because of lower prices and lax law enforcement. Other witnesses from inside the club said the floorshow stunt made everyone laugh at first, then panic. The show involved two "vagabonds" rushing the stage and a man dressed up as a policeman firing a gun at fireworks. Instead, the gun ignited the flammable ceiling. Club goers then surged for the one exit, clambering over bodies to get out. Hong Kong's ATV television news channel showed the smoke-filled nightclub after the fire with broken glass and furniture, and stray shoes scattered across the floor. Parents and government officials are now identifying victims, including the dead, in hospitals and mortuaries in Shenzhen. Bad fires and accidents are not uncommon in China, where local corruption prompts failures in fire and police enforcement of safety rules. The worst recent nightclub disaster was in the Chinese city of Luoyang in December 2000, when 309 people were killed. A welding accident in a basement engulfed an unlicensed club on the fourth floor which lacked fire fighting facilities and exits.